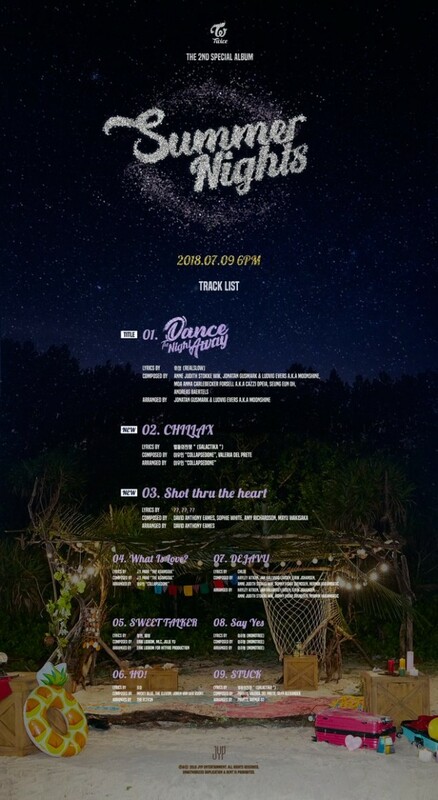 TWICE have released the hidden part of their 2nd special album 'Summer Nights' tracklist; but, the lyricist for track #3 "Shot Thru The Heart" still remains a mystery! TWICE's 2nd special album includes a total of 9 songs, including 3 brand new tracks as well as songs from the girls' 5th mini album 'What Is Love?'. Yesterday, they revealed that the lyrics to their upcoming title song "Dance The Night Away" were written by Wheesung (Realslow). Among the two new tracks revealed today, the lyrics to "Chillax" were written by Galactika, but the group has yet to announce who wrote the lyrics to "Shot Thru The Heart", simply leaving questions marks in the "lyrics by" spot. Meanwhile, TWICE's 2nd special album comeback is set for July 9 at 6 PM KST!